Last week, we said that the whole Brett Favre drama was over. That Brett declined the Vikings offer, and decided to hang up his cleats, and officially retire. Well, we couldn’t have been more wrong, as things changed in a big way yesterday. 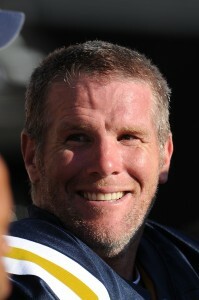 Brett Favre signed a two-year deal with the Minnesota Vikings, which puts Favre back on our TV sets this coming season. Yep, in the same week, two soap operas from the past two months came to an end, as the NFL got back two of its biggest names: Michael Vick and Brett Favre. Now that Favre is a Viking, he’s pretty much burned his bridge with Green Bay fans. They were forgiving and understanding when Favre went to play for the Jets. But that was a different conference altogether. They cut him some slack knowing that he still wanted to play, but the Packers coaching staff had already moved on to Aaron Rodgers. Now, however, he’s playing for the Packers neighbor-state rivals. They are not going to be forgiving when he comes back into town. On the flip side, the Vikings look very dangerous now. They’ve got a fantastic running game and a solid defense. The only thing they didn’t have was a trustworthy quarterback. Favre is that guy. Even though he’s in his twilight athletic years, he still gives the Vikings consistancy at the position. The Vikes need a guy who can complete passes, who they can trust with a complicated playbook, and Favre definitely provides this. Plus, they added super-speedster Percy Harvin to the mix in this year’s draft. With Adrian Peterson drawing the defense, Favre could find Harvin deep for a touchdown every game. They will absolutely be a riveting team to watch. Finally, in baseball, it looks like the John Smoltz experiment in Boston is coming to a close. The Red Sox gave Smoltz the opportunity to be a starting pitcher again. Unfortunatley, it failed miserably, as Smoltz went 2-5 with an 8.32 ERA. Now, sources say he could be heading to the St. Louis Cardinals. The Cards are making a strong World Series run, and want Smoltz to pitch out of the bullpen. Smoltz said he would prefer the National League, and said he hopes he can still be a starter. Smoltz might be in for a rude awakening if he expects teams to take that chance again. why favre would unretire again? it’s simple. because he wants to play.